Microtonal music or microtonality is the use in music of microtones—intervals smaller than a semitone, which are also called "microintervals". It may also be extended to include any music using intervals not found in the customary Western tuning of twelve equal intervals per octave. ), but do not actually name the "mathematical" terms schisma, comma, and diaschisma. "Microtone" is also sometimes used to refer to individual notes, "microtonal pitches" added to and distict from the familiar twelve notes of the chromatic scale (Von Gunden 1986, 59). ), though "Mikrointervall" is still common today in contexts where very small intervals of early European tradition (diesis, comma etc.) are described, as e.g. in the new Geschichte der Musiktheorie (Zaminer 2006, 94) while "Mikroton" seems to prevail in discussions of the avant-garde music and music of Eastern traditions. The term "microinterval" is used alongside "microtone" by American musicologist Margo Schulter in her articles on medieval music (Schulter 1998; Schulter 2001). ). The analogous English form, "microtonalism", is also found occasionally instead of "microtonality", e.g., "At the time when serialism and neoclassicism were still incipient a third movement emerged: microtonalism" (Chou 1971, 218). Alexander John Ellis, who in the 1880s produced a translation of Hermann Helmholtz's On the Sensations of Tone, proposed an elaborate set of exotic just intonation tunings and non-harmonic tunings (Helmholtz 1885, 514–27). Ellis also studied the tunings of non-Western cultures and, in a report to the Royal Society, stated that they did not use either equal divisions of the octave or just intonation intervals (Ellis 1884). Ellis inspired Harry Partch immensely (Partch 1979, vii). In 1979–80 Easley Blackwood composed a set of Twelve Microtonal Etudes for Electronic Music Media, a cycle that explores all of the equal temperaments from 13 notes to the octave through 24 notes to the octave, including 15-ET and 19-ET (Blackwood and Kust 2005, ). "The project," he wrote, "was to explore the tonal and modal behavior of all [of these] equal tunings…, devise a notation for each tuning, and write a composition in each tuning to illustrate good chord progressions and the practical application of the notation" (Blackwood n.d.). In 1986, Wendy Carlos experimented with many microtonal systems including just intonation, using alternate tuning scales she invented for the album Beauty In the Beast. "This whole formal discovery came a few weeks after I had completed the album, Beauty in the Beast, which is wholly in new tunings and timbres" (Carlos 1989–96). A form of microtone known as the blue note is an integral part of rock music and one of its predecessors, the blues. 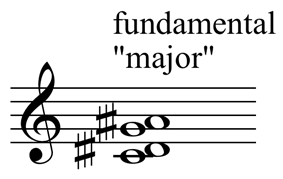 The blue notes, located on the third, fifth, and seventh notes of a diatonic major scale, are flattened by a variable microtone (Ferguson 1999, 20). Musicians like Jon Catler have incorporated microtonal guitars like 31-tone equal tempered guitar and a 62-tone just intonation guitar in blues and jazz rock music (Couture n.d.). The band Radiohead have used microtonal string arrangements in their music, such as on "How to Disappear Completely" from their album Kid A (Wilson, Penderecki, and Greenwood 2012). Battier, Marc, and Thierry Lacino. 1984. "Simultation and Extrapolation of Instrumental Sounds Using Direct Synthesis at IRCAM (A Propos of Resonance)". Contemporary Music Review 1 (Musical Thought at IRCAM, edited by Tod Machover), no. 1:77–82. Blackwood, Easley. n.d. Liner notes to "Blackwood: Microtonal Compositions". CDR018. N.p. : Cedille Records. Kholopov, Yuri N. 2003. Гармония. Теоретический курс [Harmony: Theoretical Couyrse. St Petersburg: Lan. Lebedev, Sergei [Лебедев, Сергей].2012. "Микрохроматика"[Mikrochromatika". Большая российская энциклопедия [The Great Russian Encyclopedia], 20:282. Moscow: Bolshaya Rossiskaya Entsiklopediya [The Great Russian Encyclopedia]. Rae, Caroline. 2013. “Messiaen and Ohana: Parallel Preoccupations or Anxiety of Influence?” In Messiaen Perspectives 2: Techniques, Influence and Reception, edited by Robert Fallon and Christopher Dingle, 153–74. Farnham: Ashgate Publishing, Ltd. ISBN ISBN 978-1-4094-2696-7. Rigoni, Michel. 1998. Karlheinz Stockausen: ... un vaisseau lancé vers le ciel, second, revised, corrected, and enlarged edition, with a preface by Michaël Levinas. Musique de notre temps: compositeurs. [Lillebonne]: Millénaire III Éditions. ISBN 978-2-911906-02-2 (pbk). Tsenova, V. S. [Ценова, В. С.] (ed.). 2007. Теория современной композиции [The Theory of ModernCompositon]. Moscow: Muzyka. Aron, Pietro. 1523. Thoscanello de la musica. Venice: Bernardino et Mattheo de Vitali. Facsimile edition, Monuments of music and music literature in facsimile: Second series, Music literature 69. New York: Broude Brothers, 1969. Second edition, as Toscanello in musica . . . nuovamente stampato con laggiunta da lui fatta et con diligentia corretto, Venice: Bernardino & Matheo de Vitali, 1529. Facsimile reprint, Bibliotheca musica Bononiensis, sezione 2., n. 10. Bologna: Forni Editori, 1969. Online edition of the 1529 text . Third edition, as Toscanello in musica, Venice: Marchio Stessa, 1539. Facsimile edition, edited by Georg Frey. Kassel: Bärenreiter, 1970. Fourth edition, Venice, 1562. English edition, as Toscanello in music, translated by Peter Bergquist. 3 vols. Colorado College Music Press Translations, no. 4. Colorado Springs: Colorado College Music Press, 1970. Barbieri, Patrizio. 2003. "Temperaments, Historical". In Piano: An Encyclopedia, second edition, edited by Robert Palmieri and Margaret W. Palmieri,. New York: Routledge. Orientierungen: Wege im Pluralismus der Gegenwartsmusik, edited by Jörn Peter Hiekel, 123–29. Veröffentlichungen des Instituts für Neue Musik und Musikerziehung Darmstadt 47. Mainz: Schott Musik International. ISBN 978-3-7957-1837-4. Landman, Yuri. n.d. " Yuichi Onoue’s Kaisatsuko" on Hypercustom.com (accessed 31 March 2009).